The Associated Students of Grand Canyon University once again is taking a stand against sexual violence. Led by ASGCU President Slate Herman, the student governors are hosting a week of activities for the third annual “It’s On Us,” a national campaign against sexual assaults. It kicks off Saturday with a booth at the men’s soccer game and culminates with a rally on Friday, Oct. 14. Violent crime statistics at GCU are low compared to the vast majority of universities in the U.S., but even one incident is one too many. “Sexual assault is a big concern on campuses nationwide,” said Herman, a senior business major. 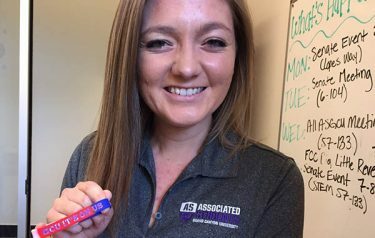 Alysha Clark, ASGCU chief of staff, displays a “GCU It’s On Us” wristband that will be distributed Saturday’ at the men’s soccer game. The ASGCU-backed campaign asks students, faculty and staff to personally commit to step off the sidelines to help end campus sexual assault. According to “It’s On Us,” both women and men are victims of sexual assault on college campuses. One in five females will be sexually assaulted during their college tenures, while 95 percent of sexual assaults on campus go unreported, according to the campaign. Herman said a centerpiece of ASGCU’s campaign will be an awareness-raising pledge drive. Students will be encouraged to sign pledges to create a community where sexual assault is unacceptable and survivors supported. Those who sign a pledge also will sign a banner in support of the anti-violence campaign that at week’s end will be hung from Building 26. ASGCU is also hosting bystander intervention seminars to help students identify situations, from dorm room, bar to party, in which sexual assaults may occur. Equally important, the training will include concrete ways to intervene. The goal, Herman explained, is teaching students to be part of the solution. Steps range from talking openly and honestly to friends about sexual assault to stopping a student who is trying to deliberately isolate or corner another student. The bystander education program, which for the first time also includes role play training, fits into GCU’s overarching mission. “It will help us make us safe, and shows that we care about each other, that we have each other’s back. It just another way to build a community,” she said. The week also includes self-defense classes and prizes, from backpacks to baseball hats, for students who participate in multiple events. Milonas is optimistic that students will embrace the weeklong educational program. “I think because the students are the champions, because it’s led by ASGCU, that other students are more apt to buy into the program. Students will believe something more if it comes from their peers instead of an unknown official or expert they don’t know,” she explained. Saturday: “It’s On Us” awareness booth at the men’s soccer game from 7-9 p.m. at GCU Stadium. Monday: Pledge drive table from 9 a.m-2 p.m. at Promenade south of the Student Union. Video at Chapel in GCU Arena from 11:15 a.m.-12:15 p.m. Self-defense class at 6 p.m. at Juniper Field. Tuesday: Pledge drive table from 9 a.m.-2 p.m. at Promenade south of the Student Union. Bystander seminar from 12:30-2:15 p.m. at Howerton Lecture Hall. Bystander role play training from 5-8:15 p.m. at Building 6, rooms 105, 107, 202 and 207. Wednesday: Pledge drive table from 9 a.m.- p.m. at Promenade south of the Student Union. Bystander seminar from 12:30-2:15 p.m. at Howerton Lecture Hall. Movie night at 7 p.m. at The Quad. Thursday: Bystander seminar from 12:30-2:15 p.m. in Building 57, Room 324. Diversity speaks at 6 p.m. in Building 22, Room 104. Self-defense class at 6 p.m. at Prescott intramural field. Friday: The week ends with a rally from 9 a.m.-2 p.m. at Promenade south of the Student Union.